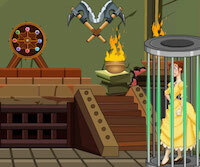 YolkGames - Yolk Tarzan Forest House Escape is another point and click escape game developed by Yolk Games. It makes everyone unhappy as Tarzan and his pets were locked up. So use your lateral thinking skill and let them be free from the trap. Good luck and have fun! was pretty good til I got the big symbols switch puzzle. I gave up. Not worth all the frustration! I don't get it... Where did you get the pattern from?